Good Monday Morning! I think I have tried to keep it real with you all when sharing on this blog. 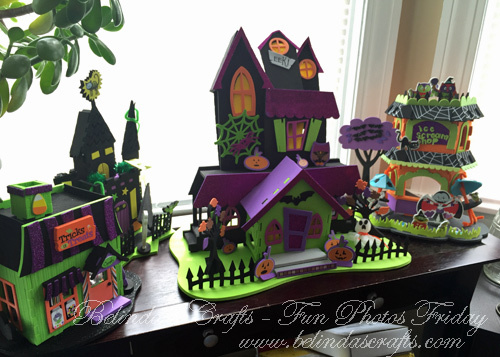 It is my intent to connect with you and provide sneak peeks “behind the curtain” of Belinda’s Crafts from time to time. 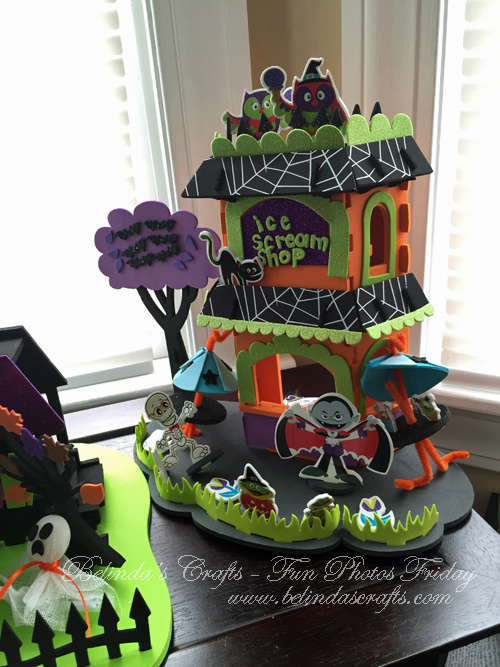 It is also my hope to eventually feature new products and announce specials for new products going into my shop. But in addition to that, I want you, as reader and customers to understand more about my business through this blog by learning more about me and my interests as well as share the ups and downs of running my own business. That said, I would like to share my recent challenges and possible solutions. Winging it. Just creating when I have a serious desire. Only working when I have large chunks of time. Not setting aside time to plan my monthly and weekly goals. Not planning my week’s schedule the Saturday before. 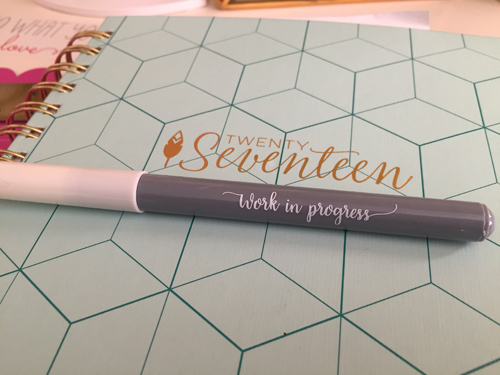 Using my planner to schedule my weekly tasks and sticking to it. Working even on days I am not inspired. Staying off Instagram because although there is inspiration there are also factors that lead to daggers in my confidence. Not comparing myself to others and having confidence that I was created with a unique gift to offer the world as we all are and to focus on my abilities, not others. Envy is draining and quite frankly a waste of time. Setting deadlines and stick to them. If I miss one or two, not to let that keep me from moving forward. So the funny thing is that I was lost without the use of my planner to guide me along my journey. I had been using it faithfully and then all of the sudden I just stopped and so did any progress I was making. So this past Saturday, I cleaned my desk and sat with my planner and scheduled my weeks’ work. I can’t tell you how much of a burden that has lifted. I woke with so much joy and pep in my step this morning knowing that I planned my path and all I need to do is sit down and work little by little towards my deadlines. I really am looking forward to my journey this week. I will not allow past setback weigh on my mind while I move forward. I hope you all have a blessed Monday and thanks for taking the time to visit! Hello, how are you? Despite some plumbing issues that we are dealing with at the current moment, I am actually feeling great. But repairs goes with owning a home and I have no regrets. I love our home and enjoy renovating it with my husband. It’s been a lovely journey watching it evolve as well as our tastes. But I digress so let’s talk craft stuff. As you know, I have curbed my craft budget and spending habits so I don’t feature as much stuff on this site. But I recently came across a tool I thought I could use quite nicely for some projects. I also don’t mind spending money on tools because they can be used again and again. 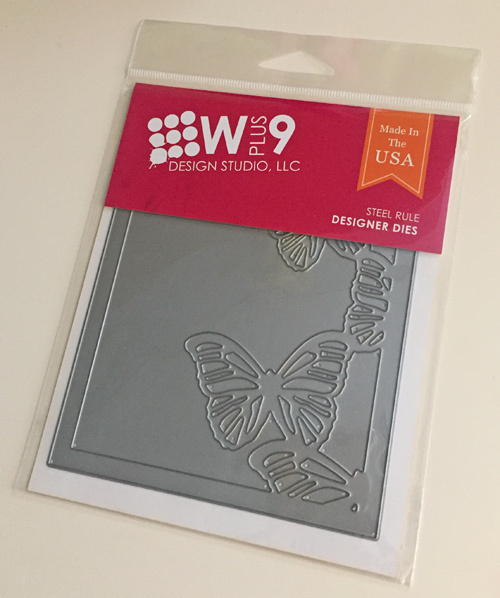 For this test, I used the WPlus9’s steel die with two types of paper. 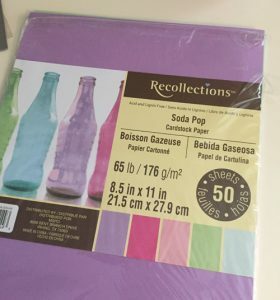 I used the Recollections’ paper pack called Soda Pop. I also used Georgia Pacific Cardstock. Although the Georgia-Pacific did not work well the Reflections worked smooth like butter. The beauty is that out of one 8 1/2 x 11 sheet I was able to cut one full die frame and then use the remaining as a contrasting background for a card. The nice thing is that the colors all coordinate quite nicely. So less time hunting for colors that go together. Then there is still a small piece of paper left that I thought would be great to use to punch out coordinating tiny butterflies with one of my Martha Stewart punches. I laid out the frames on the coordinating colored paper scraps but could easily cut them down and stamp a sentiment and stick them on a card. I own a load of dies and some I like and some I rarely use. But let’s talk about the die. 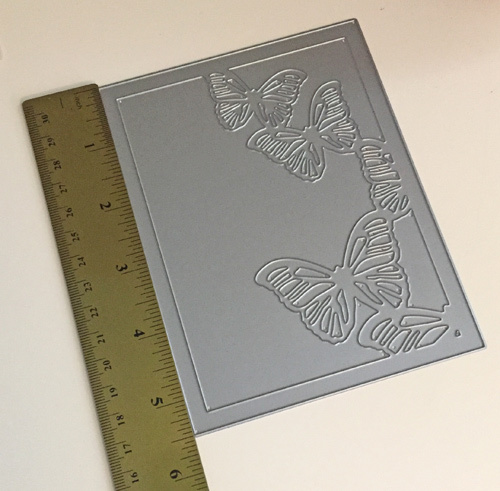 The fact that the butterfly frame is a standard A2 size (4 1/4 x 5 1/2) so it can rock the front of a card. The steel is thick and not flimsy so it produces a nice clean cut. 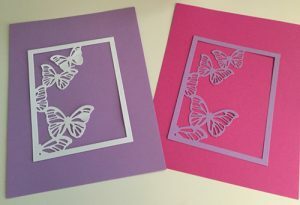 The framing of the butterflies leaves room for sentiments which is very important if you want to make cards. 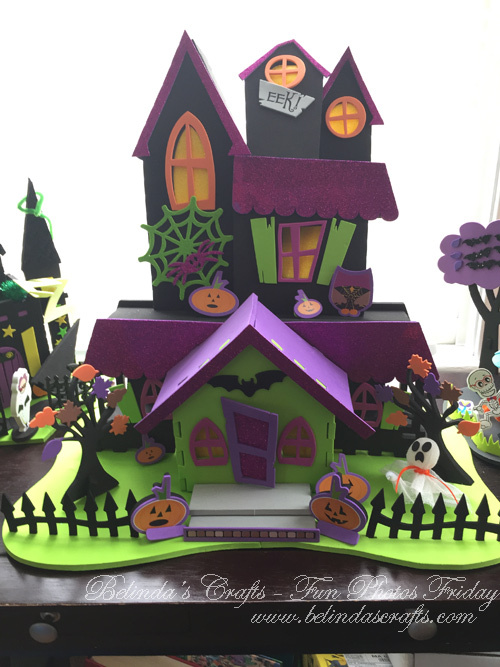 They include a lot of holes so that if your paper should stick, it’s very easy to use a pin to poke them out without tearing the paper. The die was made in the USA. It’s really great to know it’s made here and reduces our carbon footprint as well as provides jobs in local factories. I tried using it with the inexpensive Georgia Pacific cardstock from Walmart and it ripped. 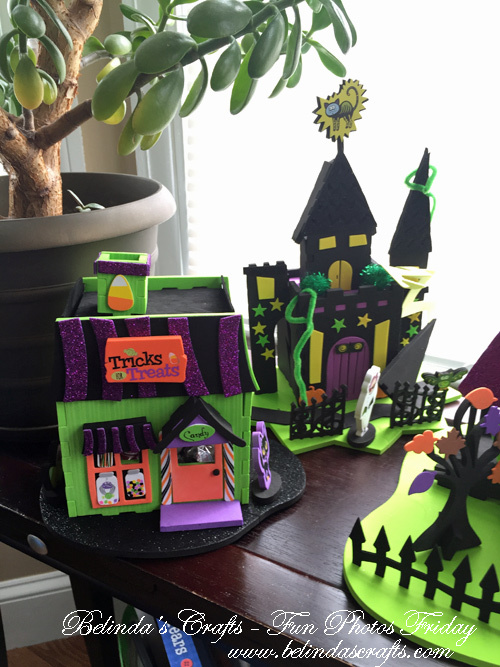 So you will need to try out a few types of paper to see which works for you. 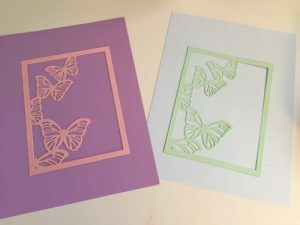 That even when I used paper that worked, I had to run it through a few times to ensure all of the detail in the butterfly wings were cut. I love this die and see that it will be a versatile tool for my projects moving forward. 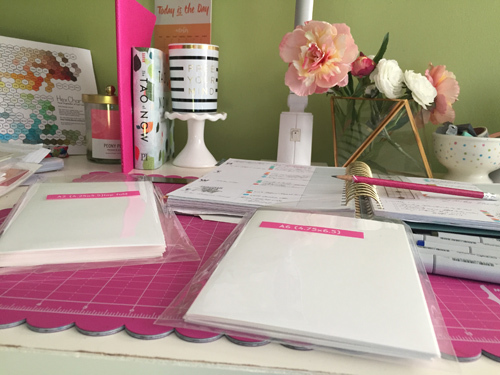 I like the sturdiness and I found that the oh so inexpensive paper packs by Recollections that you can buy at Michael’s works beautifully with the die. The paper pops out easy and the cost per sheet is so inexpensive, you can make a large number for a few dollars. I love that I can use it with my sentiment stamps and custom one’s that I design on the computer. 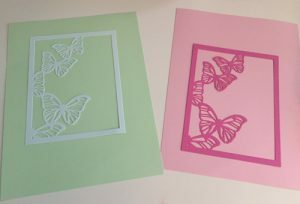 If you look at the first set of photos the white one on the left was cut using the Georgia Pacific and it didn’t cut out all of the butterfly detailing. 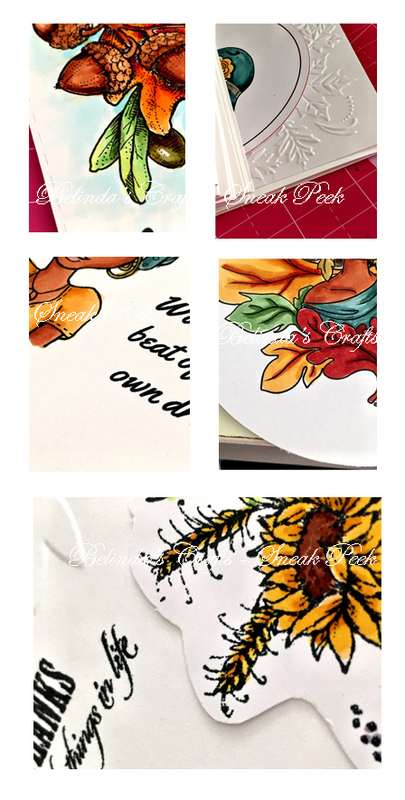 But all of the other ones were cut using the Reflections paper. I love using mine and will share some finished cards with you soon. Hello! How are you today? It’s cold and sunny outside in my neck of the woods. But nice and comfy inside. I have my cup of Chai and I am ready to wrap up work on my fall collection of cards. I had taken a long time off from production for my online store and focused on offline custom items and continuing to explore new techniques in my craft. So I have to shake off the cobwebs and get down to the business of making some products for my online store. I based this Autumn Collection on one color palette. I have never done this before and it sort of just happened that I liked the palette I was using on one card and thought hmm, that might look nice on this other card. So I created the next one with it and then the light bulb moment occurred to create my collection around this palette. I took teaser photos and included them of some of the products that will be released next week in the photo above. I am wrapping up a few and then on to the photography phase to make them ready for my Etsy shop. I am going away this weekend so I had to push my final launch date out into next week. This time of year, it’s very difficult to push deadlines out so I am going to have to hustle onward to meet the next set of deadlines. I will announce the final release date here so stay tuned. I hope you all are having a blessed day and keeping warm if you are in the colder regions.